There will be a “Work the Nantahala” falls clinic on August 11th hosted by gca instructors Jay Davis and Mark Brown. Meet in the concrete parking lot above the falls at 10am. Email boat.safely07@gmail.com to register for the clinic and or any questions. 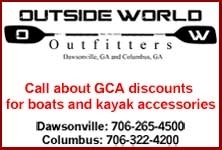 This clinic is for experienced Nantahala boaters and not 1st timers, with at least an 80% roll. Thanks!